Second-Level Supernova Award for Venturers and Sea Scouts. Earn the Dr. Bernard Harris Supernova Award while a registered Boy Scout. Complete ONE additional Venturer Nova award for a total of four. 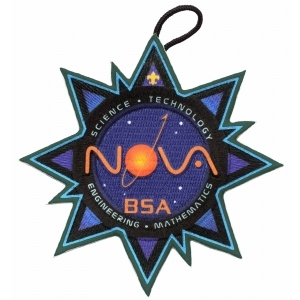 The Venturer Nova award completed should be different from the Boy Scout Nova awards previously completed. Using the guidelines found in the "Venturing STEM Explorations" chapter, complete FOUR of the topics listed above. The four topics must be different from those completed while working on the Dr. Bernard Harris Supernova Award, for a total of eight different topics. Additional merit badges earned while a Boy Scout may not be used in lieu of the STEM explorations required for this award. Be sure to receive permission from the appropriate unit leader. Research a scientific, technical, engineering, or mathematical breakthrough or invention of the past 100 years that has affected our society in a meaningful way. Develop your hypothesis on how this invention might further affect our society during your lifetime.